The Centre for Brain Research More Than Words Gavel Club for People with Aphasia has opportunities for volunteers. The Gavel Club meets Friday mornings from 9am-1pm at the University of Auckland’s Tāmaki Innovation Campus. 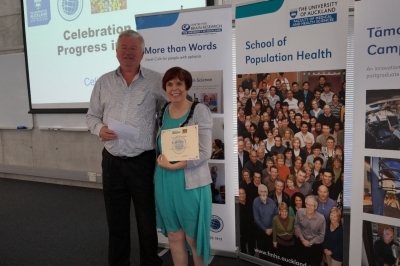 It is a research group for people with aphasia and provides an opportunity for members to develop their public speaking skills in a supportive environment, facilitated by speech-language therapists and Toastmasters mentors. Volunteers will need to meet strict criteria (including police vetting) and should have a desire to learn and work with people with communication difficulties. Specific duties include providing communication support to members during the two-hour meetings, helping members practise their speaking roles, setting up and packing up after the meeting. Training will be provided for volunteers to provide communication support. The speech-language therapist will also help the volunteer to develop their skills in helping members throughout the year. Please email cbrgavelclub@auckland.ac.nz now to register your interest as a volunteer.